A new mobile science laboratory will tour local schools in Maryland to raise student interest in STEM careers. 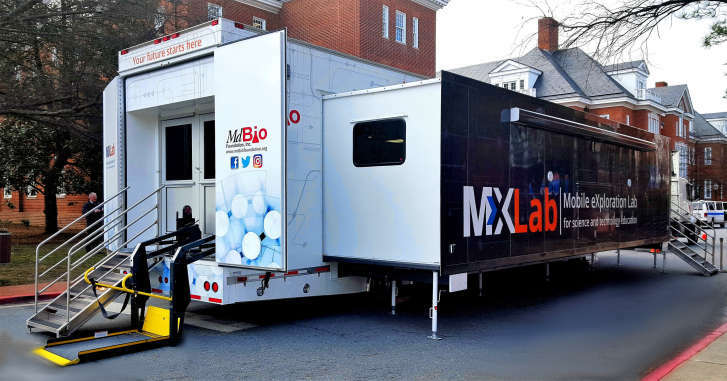 WASHINGTON — Rockville-based nonprofit MdBio Foundation has a brand new mobile science laboratory that will tour local schools to raise student interest in STEM careers. MdBio said the trailer, manufactured by Triune Specialty Trailers, is the country’s largest and most advanced mobile science laboratory. Called the Mobile eXploration Lab, or MXLab, it will travel throughout Maryland to deliver hands-on science, technology, engineering and math education experiences to youth and teens. MdBio was founded in 1991, and provides students with access to advanced technology not generally available in school settings, with a goal of inspiring them to pursue STEM careers. Its mobile lab program started in 2003. MdBio said the program has served 140,000 students to date. The MXLab will expand the program’s student capacity by 20 percent. The trailer can accommodate up to 42 students at a time. It expects to reach 10,000 students in 35 high schools this year. “The Mobile eXploration Lab is a fun and engaging environment for students to explore science, technology and the lucrative career opportunities available to them,” said MdBio Foundation CEO Brian Gaines. MDBio’s traditional curriculum is based on biology, chemistry and environmental science, and it has recently added new activities such as data set modeling, integrated computing, cyber security and game-based learning. MdBio operates other STEM education programs as well, including its Young Science Explorers Program for middle school students, the Maryland BioGENEius Award, its Advancing Tomorrow’s Leaders in STEM program, and college and career symposiums.